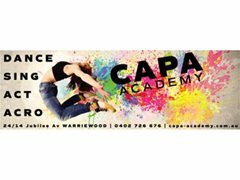 CAPA Academy based in Warriewood have a vacancy for Ballet Teacher. RAD syllabus an advantage however not necessary. The position is Saturday mornings to teach a variety of Grades and Open Ballet classes. Great rates of pay and more work is available for the successful applicant. Commencing Saturday 23rd February 2019 for the duration of the year. Paid : $50.00 + depending on level of experience. Teacher wanted for Dance school. Must love children and be able to teach all ages. RAD syllabus is what is required and training is possible for the correct applicant.